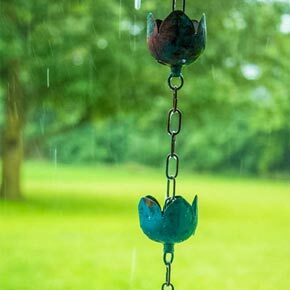 Enjoy the sights and sounds of a rainy day like never before with our artisan-designed rain chain. 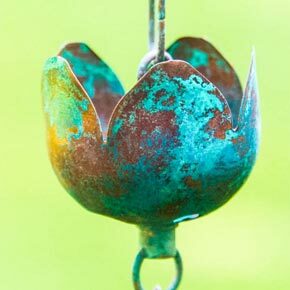 We love the high-quality metals used to make this rustic yet delicate piece. 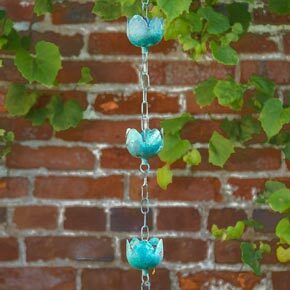 Created with a tulip motif in mind, small copper cups bear a beautiful verdigris patina and have holes to allow water to easily flow from one to the next, all along the 6' long chain. 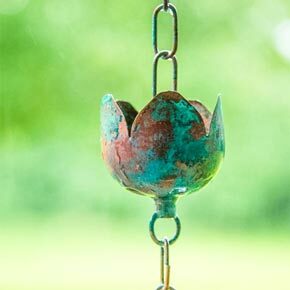 It makes a lovely sound as the rain falls, as well as a very nice decorative accessory to patios, porches or decks. This is a very well-made piece that will provide years of enjoyment. You won't find another rain chain anywhere of this quality at this price. Perfect length for easy hanging. Makes a wonderful gift. 6'Lx2¾"W.